It is increasingly common to find videos on social networks of members of the public who disentangle whales and other marine life. These videos have all the elements of an amazing story: danger, courage and, hopefully, success. However, in the Whale Disentanglement Network (RABEN, by its initials in Spanish), we never share these videos, and for good reason: While the stories are convincing, the unintended consequences of these actions can be devastating and could cause death. Even though, we do not doubt the good intention of doing the right thing and saving the whales, there is much more at stake than the life of the only whale that inspires someone to act. We know how heartbreaking it is to discover a whale entangled in fishing gear, however, we are very concerned when we see videos of people who have not been trained to perform disentanglement operations for large whales carrying out this dangerous role. So far most of the stories have had a happy ending: a released whale, a hero without injuries and an increase in the public perception of this problem for whales. However, we worry that we know that these actions can encourage others to do the same thing in order to help a whale. Whether they are motivated by a genuine passion for whales, the euphoria of risk or the hope of becoming the next Internet sensation, without knowing and considering all the risks that this implies. These types of rescues happen without a plan and without training or authorization from the federal government. The difference between a rescue by trained people and well-meaning people, but without proper training and authorization can be a matter of life or death for the whale and for the potential rescuers. RABEN members performing maneuvers to rescue a humpback whale. The rescue was done on February 2018 and was successful. In Mexico, RABEN has 180 trained members distributed within 15 teams in the Pacific Coast of Mexico and the Baja California Peninsula, they are the real heroes who rarely receive attention or appear in viral videos, but their work is to save lives, whale and human. RABEN members make incredible sacrifices to do what they do. They dedicate their lives to save these whales when they become entangled in fishing gear that endangers their lives. The members of RABEN only face the challenge of risking their lives to save whales, after an intense training and learning process, which sometimes can take years to be completed. With NO salary, they are available 24/7 to respond to reports of entangled whales. To the sound of a text or the ring of a call, with full adrenaline rush, but aware that they must remain calm, they get ready with their equipment of tools and they go out to the sea in search of a wild whale scared and wounded, which does not know that they just want to help. Doing this is amazing just by itself. Doing this day after day, without the need to publish it on social networks, and complying with the satisfaction of a job well done, makes them superheroes. The devotion and passion can drive them, but their training and previous planning is what keeps them alive. An entangled whale can weight more than 40 tons and obviously is under a very high level of stress and probably also of pain. Untangling a whale can be lethal for both, the rescuer and the whale. Everyone has heard the successful stories of the whales that have helped during their rescue or have thanked the rescuer for setting them free, but the reality is not a fairy tale, a brief conversation with any member of the RABEN team, will kindly bring you back to reality: the whales are in pain, scared and will evade the rescue efforts, they react defensively, and sometimes, respond with a tail slap or pectoral slap, which can be lethal instantaneously for anyone who receives it. Each approach can upset even more a whale which is already stressed out, lowering moreover the probabilities of success. Entangled humpback whale. It was successfully released by RABEN members in 2016. In comparison with what we see in the videos that have become viral and makes us feel good, the reality can also be tragic, like in the case of an entangled humpback whale which killed a diver of New Zealand in 2003, while trying to rescue it in the water. Even the operations performed from a vessel can be potentially mortal. Last year, Joe Howlett, a trained and experienced Canadian rescuer, died during the rescue of a Right Whale, when the fluke of the whale hit the bow of the vessel. This shows us that even with proper training and experience, the risk for the rescuers is real. Unfortunately, even the best intentions can threaten more whales than we can see. Both, Canadian and American governments suspended temporarily all the authorizations to rescue whales when Mr. Howlett lost his life. Even though the American government introduced gradually the authorizations in a matter of weeks, for Canada it took months to allow rescues again. 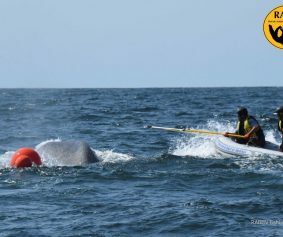 During the suspension of activities, the whales continued entangled and the trained rescuers could not respond. If a member of the public died trying to rescue a whale, the rescuing operations could be suspended permanently, which would leave countless whales without being able to be rescued and leaving them to imminent death, since the trained teams wouldn´t be allowed to act either. Even in the cases in which there is apparently a happy ending and it seemed like the life of a whale was saved, reality can be very different. Generally, in the entanglements there are difficult ties of ropes through the mouth of the whale or around a submerged pectoral fin, none of which is easy to sight from the surface. It is rare that only one rope going across the back of a whale will take a single cut to get rid of the gear. Without the right tools, gear or experience, a random single cut of a line could be tightened up or complicate even more other parts of the entanglement, enhancing the suffering of the whale and complicating the task of the real rescuers. To attend reports of large whale entanglements requires a large community of Scientifics, teams expert in entanglement operations, whale observers, captains, fishermen, policy makers and members of the public. Each one has a role, but only the trained and authorized members of the teams of the Whale Disentanglement Network RABEN must perform the rescue actions of the whales. Addressing reports of entanglement of large whales requires a large community of scientists, expert teams in entanglement maneuvers, whale watchers, captains, fishermen, policy makers and members of the public. Each one has its role, but only the trained and authorized members of the RABEN entanglement teams must perform the rescue maneuvers of the whales. * Maintain your distance, according to the guidelines of NOM-131-SEMARNAT-2010: 60mts authorized smaller vessels, 80mts authorized larger vessels or 240mts unauthorized vessels. Type of fishing gear: nets, buoys, ropes, etc. * Send a photo, it can be a photo of the camera screen or a video taken with the cell phone. * Inform about the location of the whale, you can share your current location by WhatsApp or send satellite position (latitude / longitude). * Stay in the boat, never get in the water to try to rescue the whale. 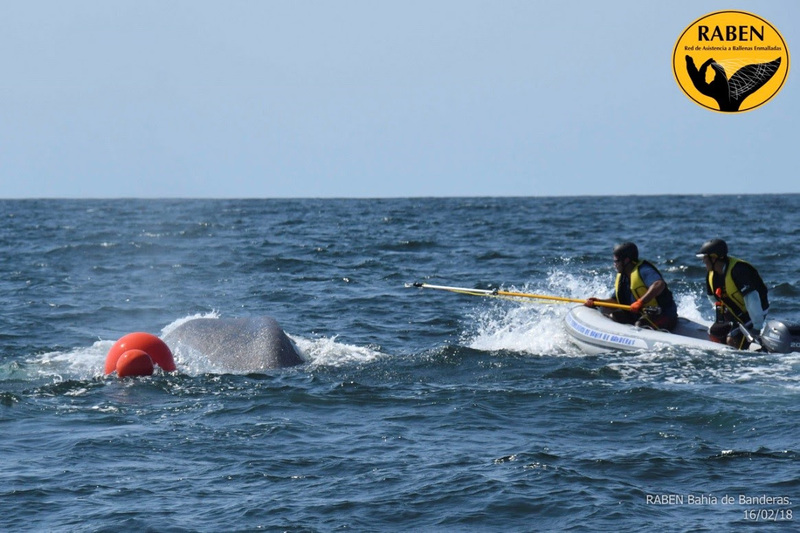 * Wait for the staff of RABEN, do not try to help the whale, by removing the lines or drag buoys you reduce the chances of releasing the animal from all nets and / or ends, which could cause more damage. * Reports the heading of the copy. * Follow the whale at a safe distance. Join ECOBAC and RABEN in our fight to end large whale entanglements. Your donations can make the difference. Thank you very much!